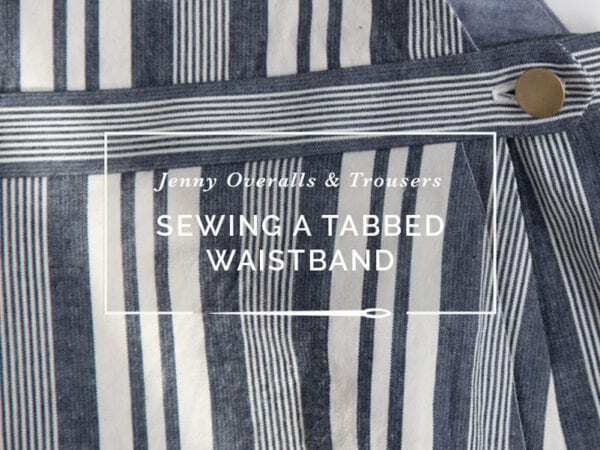 This week I shared Jenny Overalls with a hip button closure, and in today’s post I’m going to show you how to do the same, should you be feeling an itch to sub out the hip zippers called for in the pattern. To start with, you’ll need six buttons, three for each side. Our overall buckle hardware kits include an add-on for extra buttons specifically for this mod, so if you’d like to skip sourcing that many jean buttons I suggest you pick up a kit. Of course, you can just use regular ol’ buttons here too, although in this tutorial I’m using the antique brass ones we carry in the shop. 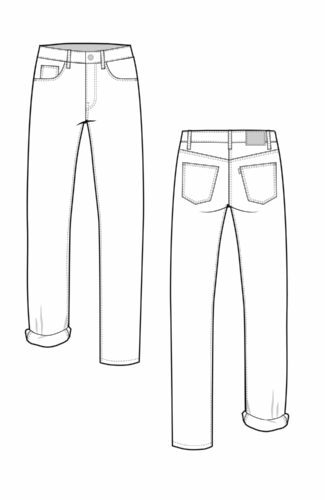 In the example I’ll be showing you today, I didn’t make any modifications to the pattern, and as a result the buttonholes extend a little past our seam allowance on the wrong side of the pants. This doesn’t bother me since I interfaced the buttonhole location and it was also stabilized by the pocket lining, but if you want the buttonholes to fall within the seam allowance on the wrong side, you’ll want to add a half inch or so to the seam allowance of the front leg only, or make sure the buttonholes are vertical and perpendicular to the seam. 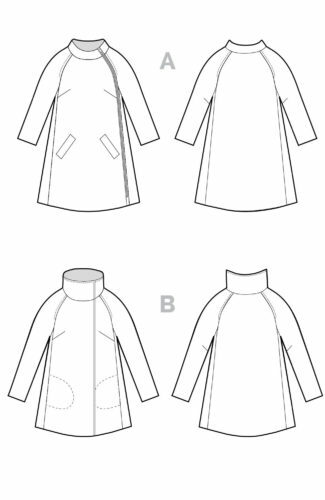 If you want to do horizontal buttonholes and feel like modifying the pattern, the length of this extension you add should be about 3/4″ shorter than the fly shield. You’ll also want to add 1/2″ to each side of the fly shield; this ensures that the seam allowance extension is completely concealed by the shield once all is said and done. If you’ve already cut out your pieces, don’t worry about this step – you’ll see below it doesn’t make that much of a difference. Now onto the sewing part! 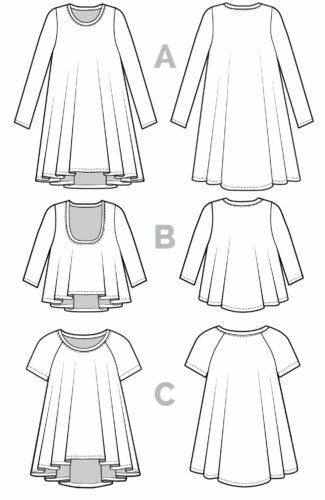 Assemble the front and back legs as directed in the instructions and finish each side seam with a zig zag or serged stitch. 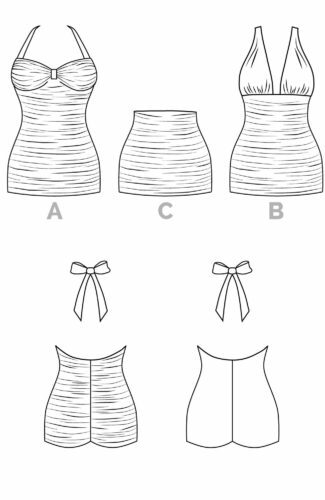 Match the front and back right leg together along the side seam and stitch together at the 1″ seam allowance. Use a basting stitch until just below the edge of the pocket (about 4-5″) – we will be ripping this out shortly so make it easy to do so with a long stitch length. Press the seam open. 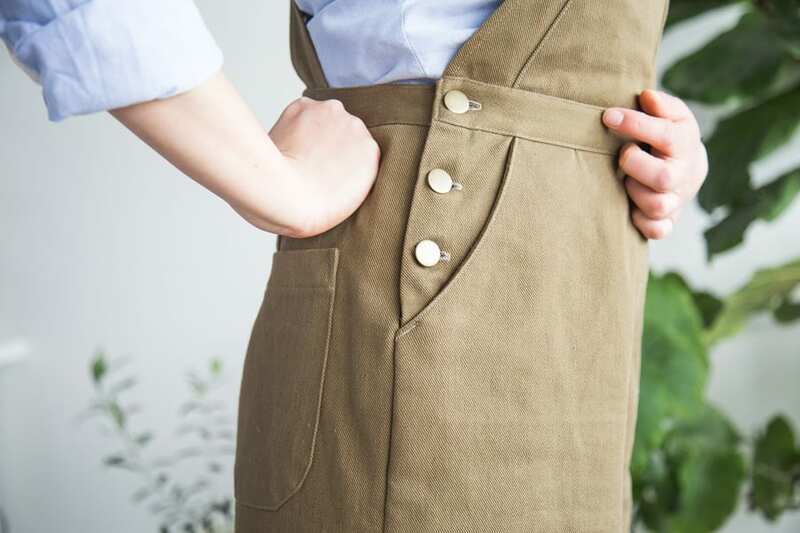 Now lay the pant leg open on your work surface and identify where you’d like to put the buttons. In the below picture, I am using my ruler to represent the waistband, lined up along the stitch line. This helps me evenly space the buttonholes. 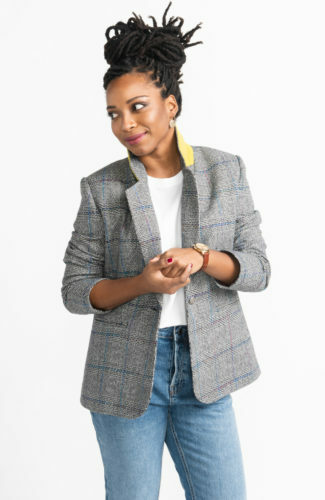 You’ll want to add two to each pant hip; if you’re adding pockets the buttons will fall along the facing. If not, the buttons should still be located within that facing area so they’re not spaced too far apart. I wanted the edge of the buttonhole to start 1/4″ from the seam; the final width should be the length of your button plus about 1/8″ on each side (although I generally add a bit more when I’m sewing heavier fabrics). 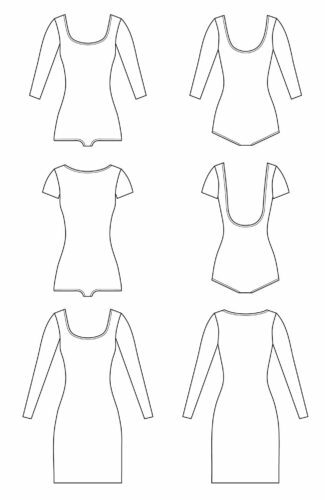 Once you have your location marked, go ahead and sew the two buttonholes (see our tutorial on sewing perfect buttonholes if you need help with this step). 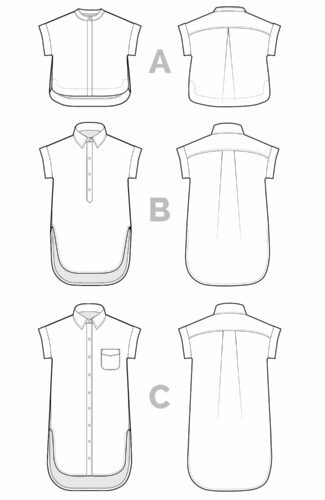 If you’re using a lightweight or loosely woven fabric, you may want to interface the location where they’ll be sewn. 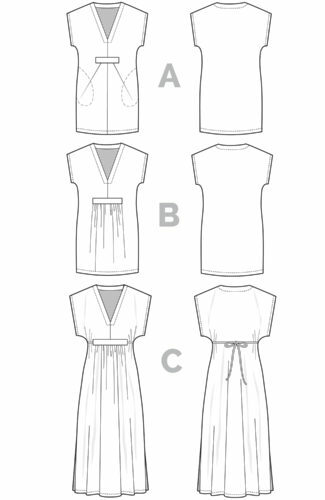 Ensure you are sewing through the front leg and folded seam allowance, along with the pocket bag if you’re sewing the pockets. You can see that buttonhole extends past the 1″ seam allowance in the picture below (I photographed this at a later stage so your side seam should still be in place); if you extend the seam allowance as I directed in the pattern mod above, the buttonhole should be contained within the extended seam. Here’s what it will look like from the front. Press the fly shield in half right sides together and sew the bottom at 5/8″. 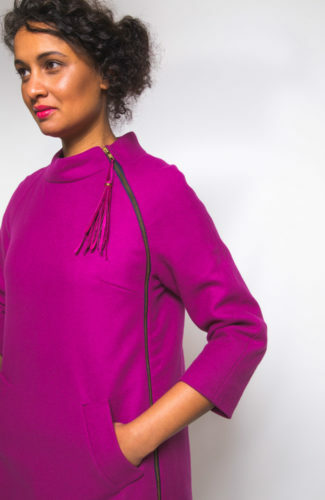 Turn inside out and finish with a zig zag, serged or bias bound seam. Pin into place so that the raw edge aligns with the edge of the back leg seam allowance. Stitch the shield to the seam allowance at 1/4″ and rip out basting stitch. Turn the pants over and press the seam flat where it joins to the shield. To anchor everything in place and stabilize the bottom of the pocket, sew a bar tack at the bottom edge of the pocket, through the fly shield below; I tried to follow the line of my topstitching. If you don’t have front pockets, stitch a short bar tack perpendicular to the seam an inch or so below the bottom buttonhole. Here’s what it will look like on the wrong side. Repeat this process for the other side and assemble the legs as directed in the instructions. 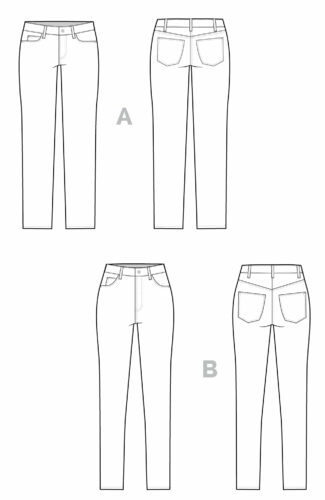 Once you’re ready to attach the waistband, follow the steps we outlined in our waistband tutorial post, with one important change. 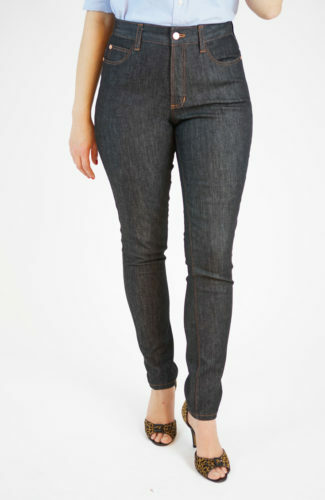 We are eliminating the pointed tab so the waistband edge aligns perfectly with the front waist seam. Simply square off the corner of the waistband so it lines up with the pocket edge. Stitch the edge of the waistband, trim and turn right side out. Finish sewing the waistband and add a buttonhole in line with the ones along the hip. 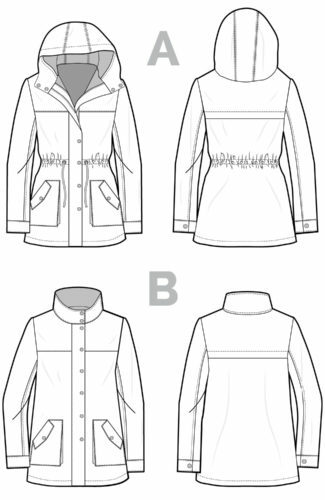 Use a fray check product on each side of the button, and a seam ripper or buttonhole chisel to open the buttonholes. 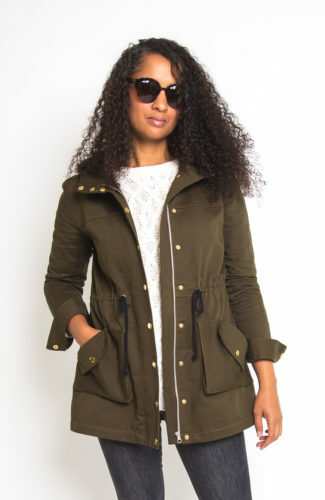 Close the pants so that everything lines up along the side seam and use a pencil to mark the location of the buttons. 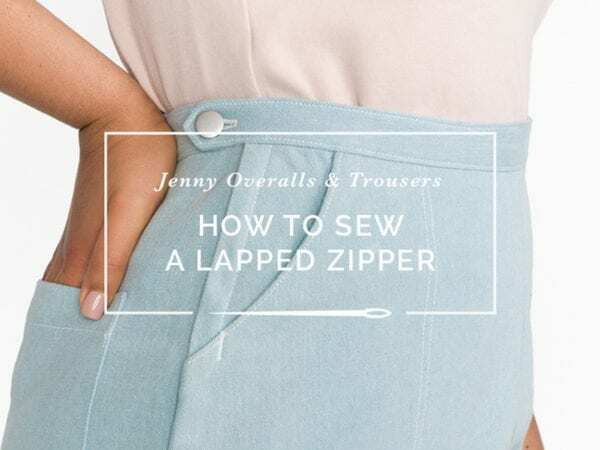 They should be inserted at the far outside edge of the buttonhole (if you center them your pants will end up being too big). Install your buttons on the fly shield and the underside of the waistband and you’re good to go! 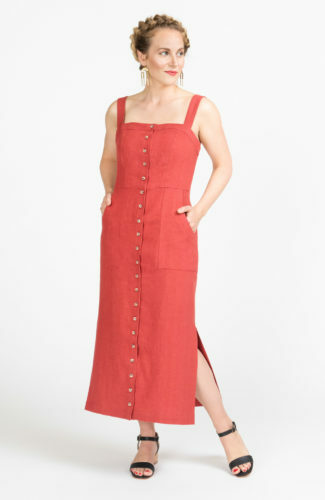 You now have a classic pair of overalls with button closures on each hip. 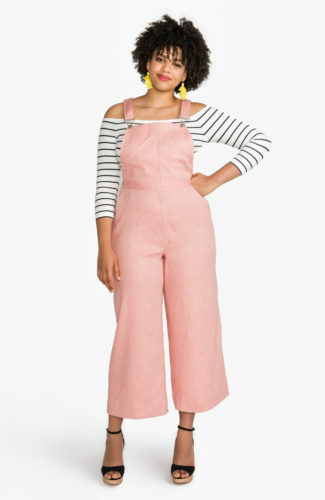 I also love the idea of doing this type of closure on the pants or shorts for a sailorish vibe. Any questions?